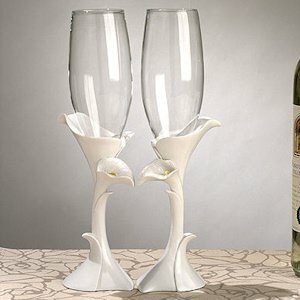 These exquisite calla lily wedding toasting flutes will add style and beauty to your reception table! 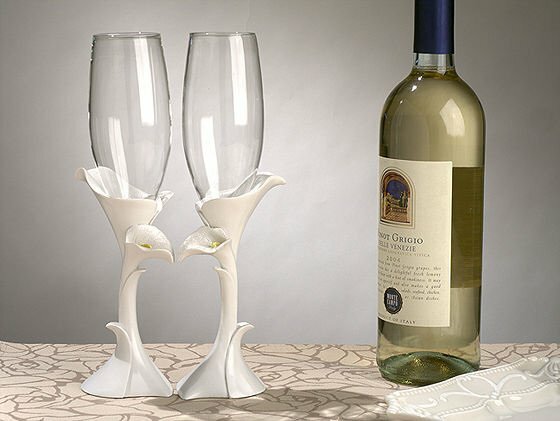 Toast to your new lives together with our delicately designed glassware, fashioned with a white resin base that has two calla lilies wrapping around the flute. The set stands 10" high and is packaged in a gift box. Some may consider giving this classic calla lily set as a gift to the bride and groom as a shower gift. Thank you for your inquiry! We do not offer personalization options for these flutes.